Subscribe to Holidays With Kids Magazine magazine for your Chance To Win 5 nights at NRMA Ocean Beach Holiday Resort, valued at over $2,380! Just 1.5 hours north of Sydney on the NSW Central Coast, you’ll find NRMA Ocean Beach Holiday Resort, the quintessential beach escape with cabin, camping and caravanning accommodation. Set on the pristine Umina Beach and surrounded by bushland, this resort serves up family fun with a resort-style pool complex, water park, adventure playground, go karts and activities. To enter the competition tell us in 25 words or less: What your family loves beach holidays? 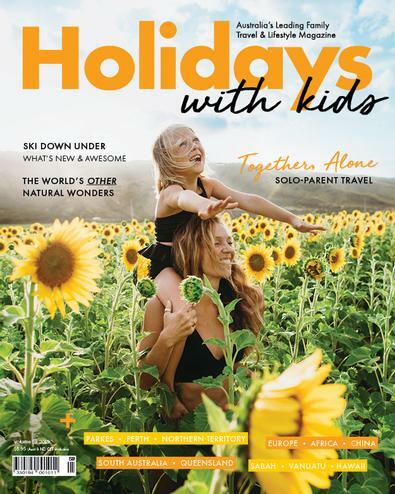 From cruises to camping, farmstays to five-star resorts, Holidays with Kids knows all the best-kept secrets of family travel in Australia and around the world. Enjoy an adventurous African safari, soak up the sun on a Fijian beach or have a scream at a Gold Coast theme park. No matter what your destination or budget, Holidays with Kids makes your wildest holiday dreams possible with practical information and helpful advice - without losing sight of those special factors families must consider when planning a holiday such as child care, safety and entertainment. I absolutely love this magazine! Every time I pick it up I find a new destination to plan a family holiday too. Always a good, relaxing read. By far the best value read when planning a holiday for the whole family to enjoy. I&apos;ve been reading it for quite a few years now, and I must say, it just gets better and better. The kids even love to read it so I often need to buy 2 copies!! Informative, useful and up-to-date information make it a great read. It&apos;s so good, I give subscriptions to friends and family for Christmas and their birthday. Thank you Holidays with Kids! You make the planning easier! Great value for money - lots of options. I ordered thsi not really know ing what to expect. I must say I ws delighted to receive a thick publication packed full of so many holiday ideas adn toi top it off my son was so excited to receive a free wiggles CD. Both my husband and I hav ebeen inspired to plan our next overseas holiday and a short break at Coffs Harbour. This is the best title I have seen for planning a holiday it really is comprehensive and I have no hestitation in recommending it. Holidays with kids is an excellent source for planning out the best possible family getaway. terriftic publication, informative, creative and insightful. Very helpful for planning family holidays.